Have you ever thought to yourself, “What I really need is a map showing what U.S. counties use the most gasoline, so that I can target my sustainability efforts there?” Funny, the Natural Resources Defense Council and Sierra Club were thinking the same thing. What they came up with gets us partway there. “We were curious about which geographic areas were most oil dependent, and thus, driving the country’s oil addiction the most,” said Deron Lovaas of NRDC in his blog post. So they made this map of 2010 oil consumption by county. They find Los Angeles County to be the worst offender, burning 1.9 billion gallons of gasoline per year. It stands to reason that L.A. County would be at the top of the list: it’s the most populous county in the country, with 9.8 million people in 2010. That’s more than twice the population of the next highest fuel consumer on the NRDC/Sierra Club map: Harris County, Texas, where Houston is located. In fact, according to a similar ranking on StateMaster.com, the state of California comes in dead last on per capita fuel consumption and, remarkably, 28th in the country for total fuel consumption, despite being the most populous state in the nation. Considering L.A.’s innovative leadership on transit and bikability, as well as the Southern California Association of Governments’ sustainability plan, L.A. is already working on its fuel consumption. Despite its first place honors in the fuel consumption category, it’s not ground zero for the country’s oil addiction. NRDC and Sierra Club did not publish the list of counties with the highest per-capita fuel use because, according to Lovaas, they were mostly highly rural counties where efforts to reduce consumption wouldn’t have much effect since there were so few people there. (Besides, in many of those areas, a large percentage of VMT is through-traffic that doesn’t originate or end in the county. )What would have been more useful than either the map they published or the per-capita map they didn’t publish would have been an overlay of the two, showing places where a lot of people are each using a lot of gasoline. Lovaas said they’ve had similar challenges looking at VMT. For example, the New York metro area showed 93.7 billion vehicle miles traveled for 2008. Compare that to Charlotte, North Carolina, with just 13.7 billion, and it looks like New York is the gas-guzzler – until you look at population. New York metro’s per-capita VMT was 4,914 vs. Charlotte metro’s 7,856. Another question mark here is the accuracy of the fuel consumption figures. The researchers figured gas consumption using VMT numbers and multiplying that by the national average for fuel economy. But people drive very different kinds of vehicles in different parts of the country. Driving a mile in an L.A. electric car is a whole different ball game than a Dallas pickup. America buys 18.8 million barrels of petroleum products every day, accounting for more than 20 percent of all global usage. This can drain roughly $1 billion on average every day out of the economy. This oil use also accounts for more than a quarter of the heat-trapping carbon pollution emitted by various sources in the U.S.
Those are pretty good reasons to figure out where the U.S. is over-using gasoline and stage an intervention, like you would with any addict. As Lovaas says, the solution for these places is within reach: better transit, more transportation choices, and better fuel efficiency. I find that streetmaster ranking very difficult to believe. CA uses 1/10th the national average of gas per capita? There’s just no way. other maps would have been more useful, this might as well be a population map, the biggest red areas are socal and newyork/new jersey, which also have the biggest populations. All this tells us is we should have less people to reduce gas consumption. A map of vehicles per capita combined with a map of gas consumption per capita would give real results, ecpecially is commerical vehicles were taken out, I’m sure SF and LA have higher fuel usage because of all the goods coming in from the east and then leaving via trucks. Agree with Jacob- if you order the Streetmaster data by per capita consumption, DC and New York (state) are near the bottom both with about 7 barrel per capita. Then below that are Vermont, Georgia, Missouri, Ohio, and California, all at about 1 to 1.3 barrels. 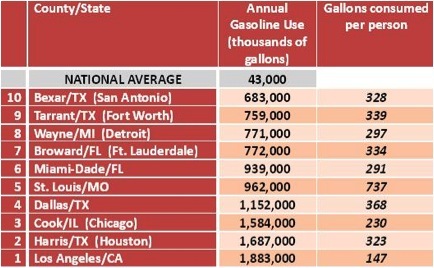 Something is definitely screwy- I guarantee none of these states consume less than 1/5 the gas DC residents do. This data would be much, much more useful if it’s sorted by per capita consumption. After all, that’s what really matters. Your VMT comparison of NYC metro to Charlotte, NC metro presumably should be 93.7 billion vs. 13.7 billion, respectively. this just looks like a population density map more. its not very useful. This map is useless, since county borders are arbitrary. Maricopa county AZ about the size of NJ. I would like to see an overlay of gas prices. A map which shows gallons of gasoline consumed annually per capita would be much more useful. That would tell us where we might more public transit, biking, or walking. 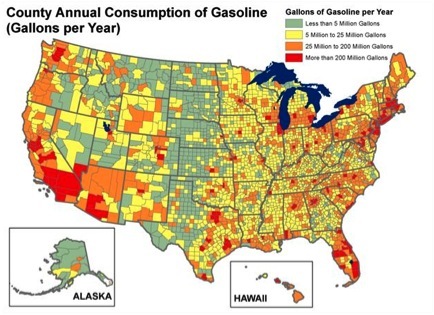 All this map tells us is that large population centers consume large amounts of gasoline. That comes as a surprise to nobody. They mention that a per capita ranking would just single out a few low-population rural counties, especially since the “law of small numbers” guarantees that a few of those are likely to stand out as the result of random sampling errors. But for a national map like they give, per capita numbers would certainly work better. And for a ranking, it might make sense to give the top ten per capita counties with population over 100,000 (or some other arbitrary cutoff). I’m not the slightest bit surprised that about half the commenters here sound like they didn’t read the article. The numbers need to be normalized by population but also by area. Large, populous counties will use more gasoline. Only by normalizing the data can the hotspots of waste be identified.